Dr George Miller has become the first non-US citizen to be granted the Visual Effects Society's honorary member status for his long-standing contribution to the industry. The filmmaker was presented with the award by the Australian VES chapter at Sydney's Australian Film Radio and Televison School last night in front of a crowd of about 40 industry leaders. Miller, who is currently completing the animated Happy Feet 2 and planning the fourth Mad Max instalment, said film represented an intersection between art and science. LA-based VES chairman Jeffrey A. Okun, via a video message, praised Miller for his ability to use visual effects to drive the story rather than to create a spectacle for its own sake. The US-based Visual Effects Society changed its constitution to allow international VES sections to nominate candidates after the Australian chapter first suggested Miller receive the accolade. 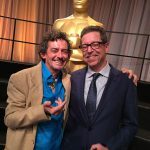 He joins seven legends of the visual effects industry who have previously received the award: John Dykstra (2007), George Lucas (2007), Douglas Trumbull (2002), Peter Ellenshaw (1998), Linwood Dunn (1998), Albert Whitlock (1998) and Ray Harryhausen (1998). Miller's credits include the ground-breaking animated Happy Feet, which grossed more than $US380 million at the worldwide box office, and Babe, which grossed more than $US250 million. VES Australian chairman Stefan Gillard presents Dr George Miller with the award.